Good fountain care really doesnt take more than a few hours every few months to keep your water feature looking good and running properly for years. When you first get your water fountain, it may take a few days to get used to the way it runs. Depending on the humidity and the size of the fountain, youll soon discover how much water you need to add and how often. Keep the water levels up to prevent damage to your pump and clean the bowl and pump now and again and everything should run smoothly. When and how often you change/add water to your fountain will depend a lot on the amount of humidity in the air, water spray from wind, and the size of your fountain. Typically, a smaller tabletop fountain will require additions of water more frequently than a large-scale outdoor water fountain with a large pool surround. Cleaning and caring for your water fountain is critically important if you plan on enjoying your investment. Avoid these and other common headaches by using the easy to follow steps listed below. Depending on the size and style, most fountains may need to be cleaned every one to three months to prevent the build-up of algae and mineral deposits. Large outdoor water fountains and estate fountains can be cleaned less frequently usually once or twice per operating season. You may need to clean the basin and pump of your Natural Stone Fountain thoroughly – this includes taking your pump apart and cleaning inside it as a build-up of algae and mineral deposits can clog the pump. The safest way to clean outdoor fountain is with a scrub brush, dish detergent, and warm water. 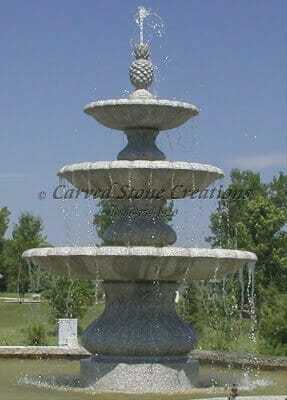 Large granite fountains can be cleaned with more aggressive chemicals and a pressure washer. Dont let your pump run dry. Make sure the pump is completely submerged in the water while running to avoid motor damage. Submersible pumps are only supposed to be used when covered with water. Never forget to refill the water and youll have a burned out pump. The pump, which is essentially the heart of the fountain, will be the first thing to show signs of debris buildup and should be wiped clean frequently. Frequently turning the fountain on and off isnt good for the pump and should be avoided. Keep your new fountain running all of the time for optimal performance and functionality. However, if youre going out of town for an extended time be sure to unplug your pump unless you have an auto-fill unit installed. Cleaning the pump isnt a difficult job but it is absolutely essential. Check the manufacturers instructions on opening the pump before taking it apart and then soak the elements in a vinegar solution. This helps to break down any mineral deposits. In hard water areas, you may need to clean the pump twice a month. Once a month is generally sufficient in soft water areas. Outdoor natural rock fountains pumps are more susceptible to becoming clogged with debris blown into the fountain. That means that all debris (dirt, sand, leaves, grass, etc) should we wiped out of the fountain regularly. Algae grow fastest in bright light so it may be a good idea to position your fountain in the shade. Apart from this, changing the water in the fountain every month will help reduce algae growth. Cleaning with bleach, Listerine, lemon juice or vinegar can also help prevent the growth of algae. You could buy a commercial algaecide. Calcium deposits can build up on the stone elements of your fountain. One of the best ways to get rid of them is with a common kitchen or bathroom lime remover. Always check the label though, as some of these products are too strong for use on bronze or slate. Never use a lime remover on marble, onyx, travertine, or limestone, as the acid will slowly dissolve these stones. The same is true for any natural stone fountain manufactured from the cast, concrete, or re-constituted stone. Maintaining the right water level in your fountain will protect your pump from burning out. It’s a good idea to check the water level daily unless your fountain was installed with an auto-fill unit. Generally, it,s better to add a small amount of clean fountain water each day rather than a large amount every few days. The water should be changed every month to help prevent algae build up and no less than every four months. In the winter, do not allow water to freeze in the pump or water lines. In cold climates drain your fountain completely by removing the plugs in each basin and draining the main basin. For granite fountains, it is not necessary to move your fountain inside or cover the marble fountain with a waterproof cover during winter season. It is preferable to remove the pump and bring it indoors if you can. This is also a great time to clean your pump, removing any algae or other debris that may have accumulated over time.